Just as the color pink has become associated with the pink ribbons you see during the month of October to raise awareness for breast cancer, “SHSU goes Blue” aims to make the color blue as synonymous with colon cancer. 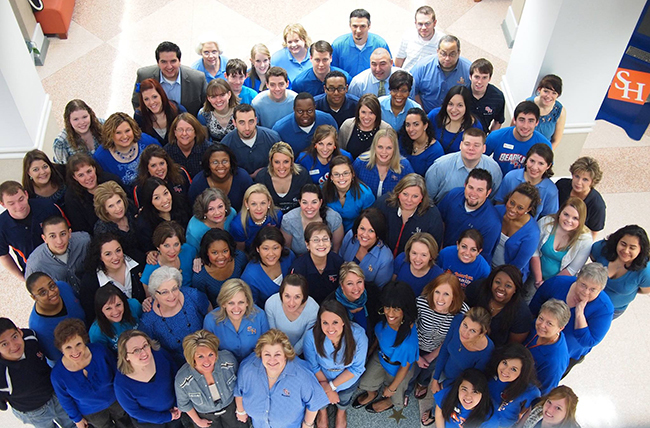 In recognition of the 7th National Dress in Blue Day, Sam Houston State University will “go blue” to raise awareness of the issue on campus on Wednesday (March 4). Colon cancer is the second leading cause of cancer-related deaths in the United States. The American Cancer Society estimates 136,830 people were diagnosed with some form of colon cancer in 2014 and, 50,000 will likely die from the disease. Sam Houston State University admissions analyst Vicki Barrilleaux will lead the “SHSU Goes Blue” event, discussing the prevalence of the disease at 11 a.m. in the Lowman Student Center Theater. Research shows that this cancer is becoming more common amongst younger generations, according to Barrilleaux, and the notion that students are “too young for cancer” is simply not true. This and other misconceptions about cancer will be the focus of her presentation. 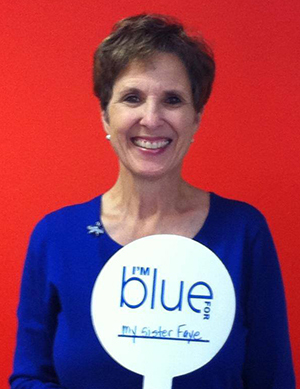 Barrilleaux is a colon cancer survivor who works actively to help raise awareness with the Colon Cancer Alliance. Colon cancer is typically considered an older person’s cancer, and while it is true that 90 percent of new cases are found in people over the age of 50, this does not mean younger people should not take colon cancer seriously. In fact, the number of incidents of people ages 20-49 being diagnosed have increased sharply over the past few years, according to Barrilleaux. “Not only have the number of cases increased but these patients are more likely to present advanced forms of colon cancer, which makes treatment more difficult,” she said. The event will conclude in the Lowman Student Center Mall Area, where those attending will take a group picture. According to The Colon Cancer Alliance, early detection means higher chance for survival. Though survival rates continue to improve, the odds of living for five years when colon cancer is detected late are still only 13 percent. Preventive measures are encouraged through regular screenings, which can prevent colon cancer by finding and removing polyps before they become cancerous. To get involved with “SHSU goes Blue,” visit the “SHSU Goes Blue for Ms. Vicki” Facebook group and use #SHSUgoesBlue help raise awareness for colon cancer. For more information, contact Arcos at CAA009@shsu.edu.